Gov. 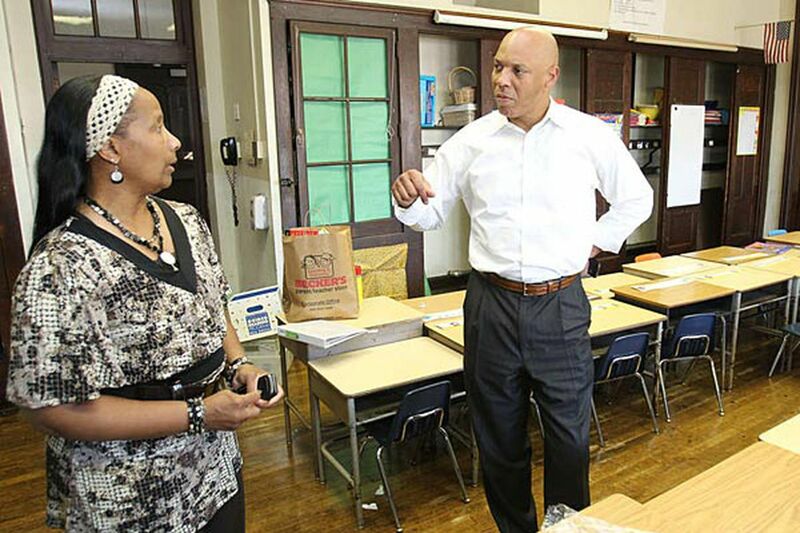 Corbett's release of $45 million in state funding for the cash-strapped Philadelphia School District will allow the return of 400 teachers, counselors, assistant principals, secretaries, and others to the schools, Superintendent William R. Hite Jr. said Wednesday. The rehiring of the workers, who had been laid off during the district's fiscal crisis, will begin immediately, and assignments will be finalized over the next few weeks. The new money also will let the district dramatically reduce the number of students in split-grade classrooms, Hite said, as well as extend music education and athletics for the full school year. "We think this is great news," Hite said during a news conference at School District headquarters. The number of school nurses, however, will not be increased, Hite said, adding that no nurses had been laid off this year. The district meets state guidelines of one nurse per 1,500 students, he said. Education advocates have called for more nurses after the death of Laporcha Massey, a West Philadelphia sixth grader, who died after suffering an asthma attack at Bryant School, where there was no school nurse. Massey had fallen ill at school Sept. 25 and was taken to an emergency room by her father when she got home. Jay Pagni, Corbett's spokesman, said the decision to release the funds had no connection to the death of the student. Addressing reporters Wednesday, Corbett said the district had made "enough progress" in managing its finances to warrant release of the state grant, citing changes outlined in a letter from Hite. Charles Zogby, Corbett's budget secretary, said the district had made "operational, financial, and managerial reforms" and presented a balanced budget and five-year plan. The state had been withholding the money until the district obtained work-rule changes in its contract with the Philadelphia Federation of Teachers. "There's been a lot of movement in the area of reform that has improved the financial health and performance of the district," Zogby said. A key element, he said, is that the district will consider factors than just seniority when it makes staffing adjustments this month. Some teachers will be shifted to other schools as the district shuffles staff based on enrollment, a process known as "leveling." "Seniority will be a factor, but not the sole factor in the leveling process," Zogby said. Hite said principals would follow the seniority process unless there was a "compelling reason" to overlook it, such as if the school were to lose a teacher who provided vital staff training or extracurricular services. "That is a pretty significant distinction in how we have operated in the past," Hite said. However, principals had less than 24 hours to come up with that "compelling reason" and show that their school would be adversely affected by the loss of a less-senior teacher, according to a district memo obtained by The Inquirer. Principals had to submit the reasons by 3 p.m. Wednesday. "We believe that the turnaround schedule is adequate," district spokesman Fernando Gallard said. "Principals are looking at a small number of teachers they have to consider." Among the staff to be recalled are 80 counselors, Hite said, which would raise the total to about 200. He did not provide specific numbers on other categories of employees to be recalled. Zogby pressed the PFT to agree to contract concessions that the School District has been seeking, including pay cuts and a change in work rules to allow the district to assign teachers without regard for seniority. "What's clear right now is, the PFT remains the only obstacle" to getting the district back on the right path, Zogby said. PFT president Jerry Jordan said that it took the state too long to release the money and that it ultimately was not enough. "The school year began with our schools woefully understaffed and services lacking for children," he said. On seniority changes in the leveling process, he said it was important that decisions be made based on objective criteria. "What we don't want is for there to be subjectivity in deciding who remains in a school and who doesn't," Jordan said. The district, awaiting the release of the state grant, opened schools last month with large class sizes and without counselors or adequate numbers of teachers and other employees. Corbett has been under pressure from local, state, and national groups in recent weeks to release the money, but state officials had been adamant about waiting for changes in the teachers' contract. The district is seeking $133 million in concessions from its unions, including $103 million from the PFT. Hite said getting that money would allow the district to restore an additional 1,300 positions to the schools. The release of the money drew mixed reviews from education advocates and state and local officials. A civil and human rights coalition that sent a letter to Corbett this month urging the release of the money called the move "an important step in the right direction." "Depriving students of access to teachers, nurses, librarians, and guidance counselors should never be used as a bargaining chip in school-funding negotiations," said Wade Henderson, president and CEO of the Leadership Conference on Civil and Human Rights. Mayor Nutter, who met Tuesday with House and Senate leaders and top officials in Corbett's administration, said he was not aware that the governor was going to release the money, nor did he know what persuaded Corbett to change course. "They made the decision however they made it," he said. "For that, I'm certainly appreciative." Sen. Vincent Hughes (D., Phila. ), on the other hand, called the release of the state funds late and far short of a long-term solution. "This does nothing to address the issue of the loss of $311 million since the governor took office," he said. "We should be creating a thriving school district. We are barely surviving." Nutter also cautioned that the $45 million was just a small piece of the overall solution to the budget gap. He noted that legislation to create a city cigarette tax, worth as much as $90 million a year to the schools, was languishing in Harrisburg, and that he and City Council had yet to resolve their differences about how to fund the city's $50 million portion of the school bailout. Nutter has proposed borrowing the money, but a bill he sent to Council that was key to doing so has not been introduced for lack of a sponsor. Council President Darrell L. Clarke wants to transfer $50 million from the city's general fund in exchange for a portfolio of shuttered school buildings that could be sold. Council is poised to pass a bill Thursday to transfer those funds, but the mayor is not bound to forward the money to the district. Asked Wednesday whether he would sign the bill, Nutter said, "I never predict what I'm going to do with a piece of legislation before it gets to my desk. "The larger issue here is that the discussion continues between myself and City Council," he said. "We still have time on our clock to deal with these issues. . . . We'll get it done."